Some newly minted college graduates struggle to find work. Others accept jobs for which they feel overqualified. Student debt, meanwhile, has topped $1 trillion. It’s enough to create a wave of questions about whether a college education is still worth it.A new set of income statistics answers those questions quite clearly: Yes, college is worth it, and it’s not even close. For all the struggles that many young college graduates face, a four-year degree has probably never been more valuable. 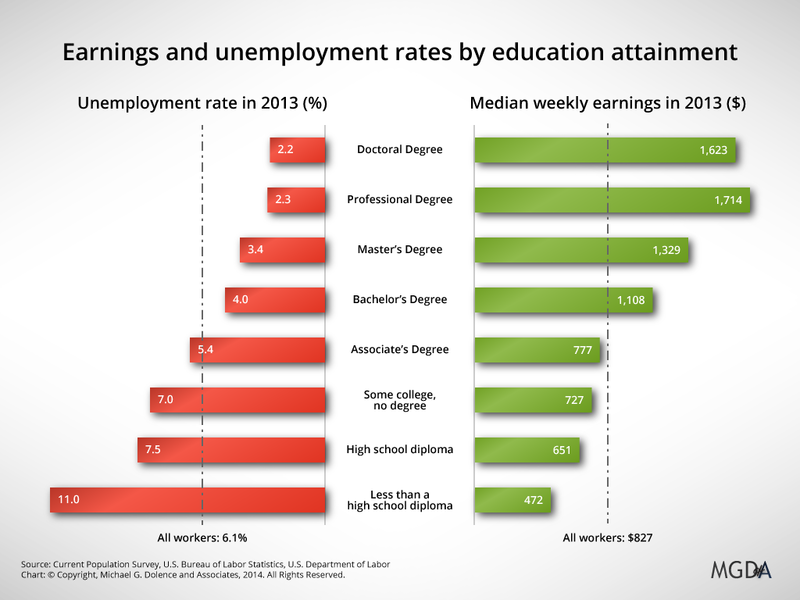 The U.S. Bureau of Labor Statistics track and publish data illuminating the differential that education attainment provides in both earnings and employment. The data is both compelling and has been consistent over the years. But is this sufficient to warrant a trillion dollars in student debt, or compete against infrastructure and social needs for public funds. Higher Education leaders and advocates must take great caution in relying on this argument as a sole response to demands for accountability, responsiveness and value-added. There are many ways to strengthen and deepen this fundamental value equation. One example is to focus upon the relationship between curriculum and to develop the talent that advances responses and solutions to global issues, opportunities, and the effects of the paradigm shift. For example curriculum such as programs in digital film, fraud and forensics, game art and design, optimizing social media, high performance learning, environmental chemistry, project management, performance optimization, or global commerce position curriculum to support existing and emerging communities of practice that are tightly coupled to opportunities. They also all provide a very powerful framework for a strong liberal arts foundation that is highly contextualized in contemporary frames of reference. Higher education and learning environments continue to develop and are transforming the global learning ecosystem. For a look into the future from a different perspective visit Thomas Frey’s Blog for a peak at 162 Future Jobs: Preparing for Jobs that Don’t Yet Exist. Jobs are a focus many academics find alienating as a frame of reference for understanding the value of an education. For a great portion of the population they help contextualize the investment in learning with a proposition for a return on that investment in a tangible career thereby substantiating the broad statistic of earnings over their lifetime. More to the point, in addition to the intrinsic value of a degree, institutions must build an institutional/programmatic value equation for prospective students and their families to consider while they are engaging in the process of deciding where to go to college. The equation must have the full power of the curriculum and emanate from the strategic and academic plans behind them and they must be warranted by a comprehensive assessment process. This requires a systematic, cohesive structured value equation for curricula, research, and the contribution that educational experiences have on each learner striving to optimize their own economic health, quality of life, and future. Where does one begin? At the start of the Academic Strategic Enrollment Management Series I paraphrase the Clinton/Carville 1992 quote by asserting “It’s the curriculum stupid!” This focuses attention on the perceived and actual value of the curricular/learning experience provided to a learner in exchange for resources. If all curriculum is perceived to be of equal value, such as in a commodity (subject of another blog post), and the only variable is the price, what is the competitive strength of any given institutions curriculum. Don’t be fooled by the draw of premium brands such as Harvard, MIT, Stanford, Yale … these operate in a different competitive structure than the rest. The concept of focusing upon value is multifaceted. Value immediately conjures up the notion of cost-benefit analysis and most understand the concept fairly well, even if they choose to ignore it. Value is also highly contextualized to the individual or organization doing the valuing. When it comes to exchanging services for long commitments in time or large commitments in money the concept must be contextualized to the individual. Enrollment managers have understood this reality but it is more rare among academics. Focus on value means being able to demonstrate value and it is not a formula or slogan or marketing question but one of fundamental benefit from and engagement with a learning opportunity or pursuit of a credential. For one it is a question of differentiation. Is one curriculum distinguishable from another. Substantiating and continuously enhancing real and perceived value through the academic experience. Differentiating the value of one credential from another as a competitive strategy. This is a difficult task in a world where credentials are viewed as commodities of basic equal value regardless of source. The purpose of this blog post was to raise the concept of developing real and perceived value by embedding the focus deeply in the strategic plan. Except named premium credential brands, price has become the number one issue and it very desperately needs to be balanced by the value of the credential and the experience. This requires evidence, proof if you will, that the many dimensions of value emanate from progress through the degree program. Platitudes are too often relied upon. What is needed is a coordinated cohesive effort to design, develop, and experience quality (not the my students love me type) within the academic program. To find it in the academic program it must first be in the strategic plan. Note to reader: Follow our blog series and posts they will continue to develop this theme and provide insights, methods, suggestions, and opportunities to improve both real and perceived value in the academic program.